He Who Must Not Be Named has returned to power. 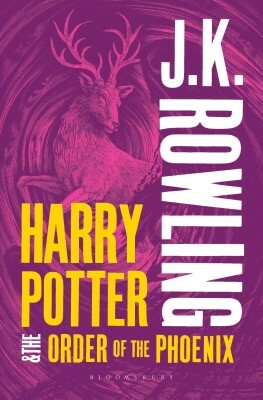 In the fifth installment of J.K. Rowling’s bestselling series, Harry Potter returns to school to find that Voldemort’s return is being called Dumbledore’s propaganda, and that he is being labeled a liar. Summary of the Book Harry Potter thought the world was about to end. After all, Lord Voldemort was back. However the newspapers did not contain any information about such a thing. In fact, Cornelius Fudge, the Minister of Magic began calling Harry a liar, taken into the deceit of Albus Dumbledore himself. Summoned to a hearing where he faces charges for casting a patronus, he finds that not all is well in the Wizarding World. Friends turn foes and Hogwarts once again is shrouded in controversy as people begin to question whether its Headmaster has begun to lie because he desires power. Not all is bad though. For out of the ashes left in Lord Voldemort’s wake rises the old nemesis of the Death-Eaters and Dark Wizards alike: Dumbledore’s Order of the Phoenix and Harry hopes he might be allowed to play a role. Dumbledore however, has other plans. About J. K. Rowling Joanne Rowling is an English writer. She achieved cult-status with seven Harry Potter books, The Tales of Beedle The Bard, Fantastic Beasts and Where To Find Them and Quidditch Through The Ages. She has also written two murder mystery novels under the pseudonym of Robert Galbraith. Jo completed her B.A. in French and Classics at the University of Exeter. She was awarded the title of Officer of the Most Excellent Order of the British Empire for her contributions to charity and literature.